Michael Trusnovec and Laura Halzack in Paul Taylor’s Mercuric Tidings. Annamaria Mazzini in Paul Taylor’s Black Tuesday. Photo by Lois Greenfield. Retiring in 2011, Mazzini had been with Taylor for 16 years. After 21 years, Trusnovec is still at it. Now, the pair of old college chums is returning to SMU this month to set a sunnier Taylor piece, Mercuric Tidings, on dance students at the Meadows School of the Arts for their spring concerts April 5-9. While in North Texas on Feb. 11, Trusnovec also will appear at the Eisemann Center in Richardson, where the recently renamed Paul Taylor American Modern Dance is performing Book of Beasts and Cascade, along with the world premiere of former company member Lila York’s Continuum. The Eisemann Center started an ongoing relationship with Taylor, now 86, for its grand opening in 2002, with the company appearing about ever other year. SMU has more informal, if longer running ties. Besides Trusnovec, SMU graduates Parisa Khobdeh and George Smallwood are members of the main Taylor troupe while Lee Duveneck is in Taylor II. Michael Trusnovec in Paul Taylor’s Beloved Renegade. Photo by Paul B. Goode. Mazzini and Trusnovec hail from small communities in the Northeast – Allentown, PA and Yaphank, NY on Long Island, respectively – and each arrived at SMU with the intention of going into musical theater. So when Mazzini turned him on to her favorite choreographer, Trusnovec recognized the drama in Taylor’s work. Trusnovec started dancing when he was six. After being named a Presidential Scholar in the Arts, he was recruited by SMU, a school he hadn’t heard of. He decided to attend after receiving a full scholarship and realizing if he stayed in New York he might catch the auditioning bug and never finish college. She had danced a little as part of the pep club at school but started formal lessons that summer. Performing in summer stock in Allentown while she was still in high school, Mazzini heard about SMU from the producers. She auditioned in New York and got in. Michael Trusnovec in Paul Taylor’s Brandenburgs. Photo by Paul B. Goode. Persistence paid off when it came to getting into the Taylor company. Mazzini first auditioned for Taylor II when it launched in 1993 and she was a junior at SMU. She didn’t make it past the first callback but returned to New York that summer to take classes at the Taylor school, research dance history at the library and generally live the dancer’s life for two months. After graduation, she moved to the city and continued to study at the Taylor studio until she was picked for the junior company in 1995. Also hell bent on dancing for Taylor, Trusnovec had a shorter journey into the company. “I knew they were holding an audition about a week after graduation. I had the notice on my refrigerator for months and was already plotting.” He was picked for Taylor II a year after Mazzini. Two decades later, they will be setting one of Taylor’s fastest, densest and most dangerous pieces on student dancers at their alma mater. Mazzini will do the bulk of the teaching of Mercuric Tidings, spending about two weeks at the university. Trusnovec will come in for two days. Michael Trusnovec in Paul Taylor’s Last Look. Photo by Paul B. Goode. 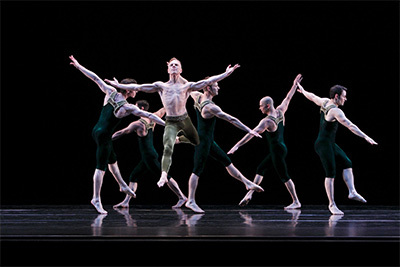 Continuum, the Eisemann premiere, is part of the Taylor company’s shift to performing pieces not choreographed by its namesake leader. It’s set to Max Richter’s recasting of Vivaldi’s The Four Seasons, a popular score for dance. Trusnovec says it’s a highly formal, structured work that starts out with stiff staccato movement and slowly becomes lighter and more open. Also on the bill, 1971’s Book of Beasts contains fairytale-like creatures, all originally danced by Taylor himself, according to Trusnovec. The piece references the early modern dance of such pioneers as Isadora Duncan and Martha Graham. 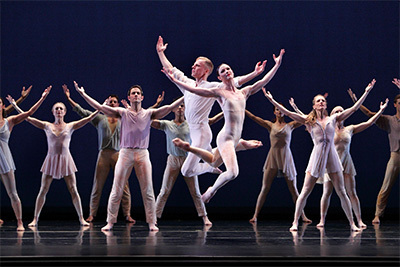 The other Taylor work on the program, Cascade, is pure dance, full of entrances and exits, circles within circles, and other simple, symmetrical patterns, Trusnovec says. As he and Mazzini set the duets from Mercuric Tidings on current SMU students, they will be dancing together again right where their mutual love affair with Paul Taylor began.